"This decision is in the best interest of the Navy, the families of the Fitzgerald Sailors," the Navy said in a statement. Former USS Fitzgerald commanding officer Cmdr. Bryce Benson and former crew member Lt. Natalie Combs will receive letters of censure, but charges against them will be withdrawn and dismissed, the Navy statement said. Letters of censure acknowledge acts of wrongdoing but have no legal ramifications. The USS Fitzgerald collided with a Philippine-flagged merchant ship on June 17, 2017, in Japanese waters about 56 nautical miles southwest of Yokosuka, where the United States has a naval base. The bodies of the seven U.S. sailors were found in flooded berthing compartments of the destroyer the next day. In 2018, Benson pleaded not guilty to two counts of dereliction of duty through neglect and improper hazarding a vessel through negligence, according to court documents. The documents said Benson "negligently failed to ensure the safe navigation of the said vessel, as it was his duty to do so as commanding officer." Benson also faced a charge of negligent homicide, but it was dropped last year. Combs was charged with negligent dereliction of duty resulting in death and negligent hazarding of a vessel in the collision. Charging documents said Combs "should have known of her duties" and "was derelict in the performance of those duties." 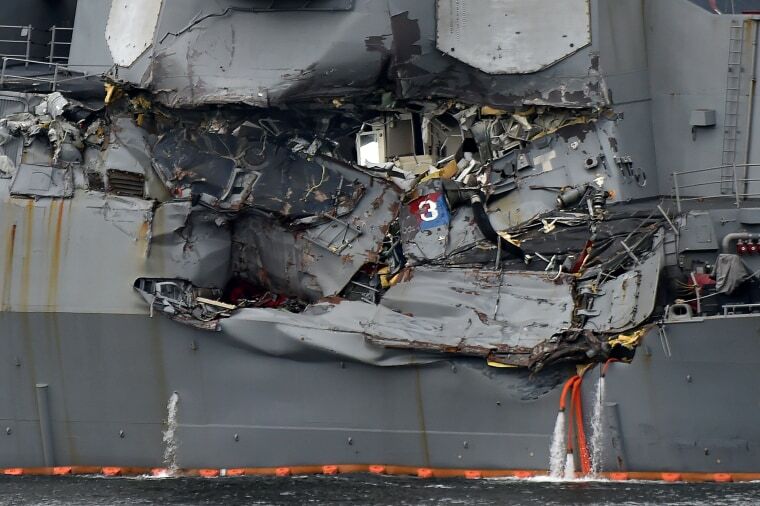 Wednesday's statement from the Navy said the "comprehensive program to improve Navy readiness and training, to do everything possible to ensure that accidents like this will not recur, remains on track." "The Navy continues to strive to achieve and maintain a climate of operational excellence," the statement said.